How Do You Know When It’s Time To Buy New Office Cubicles? Buying new office cubicles can be overwhelming when there are so many types to choose from. Since most average office workers spend a majority of their time at their workstations to do individual work, a new office cubicle will no doubt be continuously utilized throughout the workday, making it important to first assess how your office actually works. 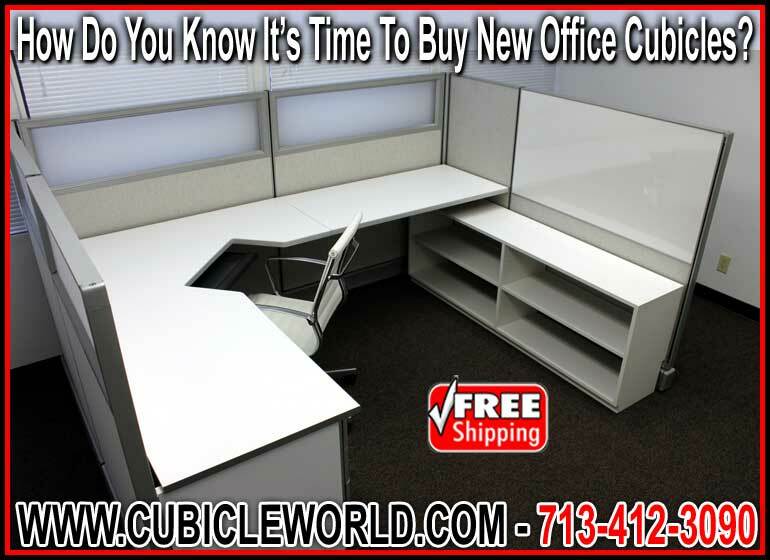 At Cubicle World, where we specialize in bringing you the perfect office cubicle, we can help deliver a workstation that supports the daily operations of your business while being comfortable enough for your employees to enjoy working in throughout the day. There are several situations that would make buying new office cubicles a good choice for your business. Maybe it’s your first time to buy cubicles, such as when moving from an open-plan layout to a closed-plan or blended one. If your workplace currently consists of traditional desks or any other open-concept layout that’s left your employees in the open, then it really could benefit your office to invest in office cubicles. Many companies have adopted an open-concept layout with the hopes of creating a more informal atmosphere that fosters creative collaboration among employees. Unfortunately, recent studies have shown office spaces without partitions to be detrimental to the overall productivity of staff, often due to the level of distractions and breaches of privacy, both visual and sound-related. With new office cubicles, your employees can enjoy a small space of their own, allowing them to stay focused on solo tasks without the uncomfortable feeling of being watched or even micromanaged. The close proximity still encourages collaboration and interaction, but their degree is controlled more by the individual office worker. Along with more privacy, new office cubicles also provide ample personal storage space in many forms. Do you have a stack of papers just sitting on your desk or in one of its drawers? It may be better to purchase a cubicle that so often comes built with a file drawer, designed specifically for handling files for easy searching and sorting. Cubicle walls can also double as space-saving bulletin boards for easy-to-find memos and other notes. You might also find it necessary to buy new office cubicles when moving to a new office building. This tends to be important when the new office space is markedly different in floor shape or size from your previous space. What furniture worked for your old office might be untenable or unnecessary in your new office, especially when trying to re-establish a comfortable flow around the office without crowding from furniture and equipment. Along with assessing your new space, it’s also helpful to take into account a projection of how the size of your team may change over the next year or so. With this information, you may find that it’s best to invest in new office cubicles that respond to these changes in the company. It could also be that the cubicles currently being used in your office are simply uncomfortable or generally unsuited for your employees and the work they do. Some of the most common employee complaints are actually of ergonomic concern—pain in the lower back, neck or legs, as well as headaches and fatigue. New office cubicles might be able to solve some of these complaints, through such things as attention to work surface heights and depths, along with reachability of storage features such as overhead bins and trays for binders or loose paper documents. Lots of other problems can arise from your current office cubicles. Do you have a storage drawer that is difficult to open or inoperable? Is your work surface warped, peeling, or heavily scarred? Is your entire cubicle wobbling? While any one issue can be easy and relatively inexpensive to repair, many issues at one time could mean that purchasing a new office cubicle is a more cost-effective decision. At Cubicle World, our cubicles are available in a number of heights and sizes, as well as an extensive array of materials, colors, and trim. And with a number of storage features to choose from as well, you’re bound to find a new office cubicle that perfectly matches your work environment. Call us now to discuss your cubicle needs as well as to find one of our many available eight-hour ergonomic chairs to supplement your new office cubicles, complete with various adjustable elements and supportive cushioning to keep you and staff in maximum comfort throughout the workday.